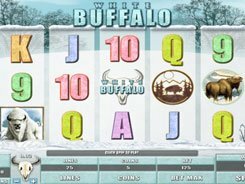 White Buffalo is an animal-themed slot played over 5 reels and 25 paylines and powered by Microgaming. A coin size ranges from $0.01 to $0.2, with up to 30 coins accepted per win line. 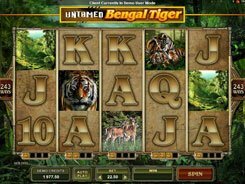 Overall, you can bet up to $150 per spin, which is an appealing option for high-limit bettors. Along with standard poker cards from 9 to Ace, there are also animal symbols like Moose, Elk, Ram, White Buffalo, etc. 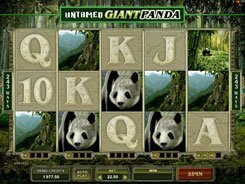 The Skull is a scatter and the biggest payer in the slot that awards x2 to x50 times a total bet if you get two to five of them anywhere in view. The symbol depicting a silhouetted buffalo with a brown landscape is a wild that substitutes for other icons and pays out $5000 for five of a kind. 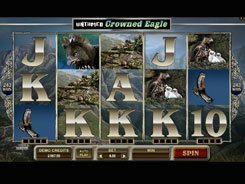 When playing the slot, you can benefit from a free spins feature that is triggered randomly on any spin awarding 6 free spins. 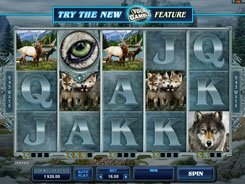 During the feature any Moose, Elk and Ram symbols that appear on the reels will transform into the White Buffalo that is the highest paying regular symbol in the game producing a 1000-coin win for five of a kind.